No news has been issued recently by Canada Zinc Metals Corp. (CVE:CZX), (PINK:CZXMF). The company has remained silent since mid-September. Nevertheless, CZX has been showing a very interesting performance on the market these days. As a whole, the shares has been regressing over the last 2.5 months on the TSX Venture Exchange (CVE). On the last days of September, the stock even hit a two-year low of $0.335. Since then, however, a positive change has occurred. 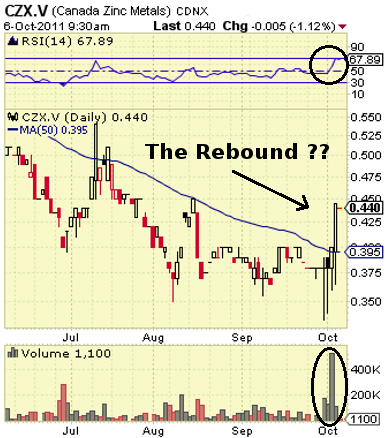 CZX has moved 17% up within the last two sessions. The rebound began on Tuesday, and was confirmed by the huge turnover of 530 thousand shares. It surpasses several time the daily average volume and represents an 8-month high for the trading activity on the CVE market. The latest piece of news we saw from Canada Zinc, was released about three weeks ago. It contained detailed information about the company's 2011 diamond drilling program commenced in early June on the 100% owned Akie project in British Columbia. Until mid-September, eleven holes had been drilled. Assay results have not been yet officially announced. Perhaps they will come up any minute and will have their influence on the stock performance too. In the mentioned September release, Canada Zinc states: "Drill production and recovery has exceeded expectations and management is very pleased . . ." We shall see what this exactly means after the assay results become known to the public. Investors are also on the wait for the more recent financial reports of the corporation. The previous ones were filed in the end of May and were related to the first quarter of 2011. Since then, we have had no information about the financial condition of Canada Zinc, though it is already October now. Still, we can note that the mentioned reports indicate stable fundamentals. In the end of March, Canada Zinc had more than $8.6M in cash and over $23M in working capital.